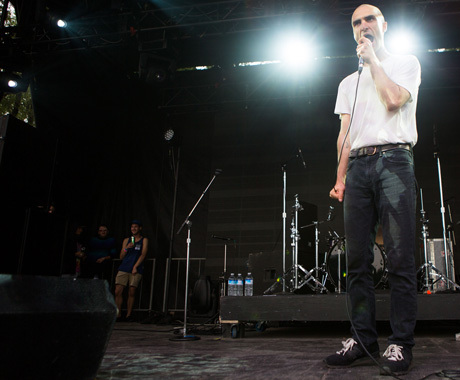 With a long-lost recording between Majical Cloudz' Devon Welsh and TIME Festival headliner Grimes surfacing online earlier in the week, festivalgoers could be heard conversing about whether or not the electronic pair would be reuniting on stage for a rendition of their uncharacteristic "indie rock" number. Nevertheless, it was business as usual for the Canadian two-piece, who delivered a stellar set that mostly fell on deaf ears Saturday afternoon in Toronto. Although the band played only a handful of songs, closing number "Silver Rings" more than made up for the group's short set and hinted at a higher spot on the marquee next time around.